Once owned by Malayan Railways, a plot of state land next to Blair Road overgrown with shrubs will be cleared for the building of a carpark and bus interchange. They will be ready next year, in time to take the place of a carpark with 92 spaces and a bus terminal at Singapore General Hospital (SGH). The transport facilities in front of its National Dental Centre near Eu Tong Sen Street are to give way for a centre for elective surgery. In confirming the move, a Health Ministry spokesman said: "The new terminal is expected to be ready by end-2017 and the existing bus terminal would then be closed down." The Elective Care Centre, scheduled to be ready by 2022, will add more operating theatres, specialist outpatient clinics and inpatient facilities to SGH. 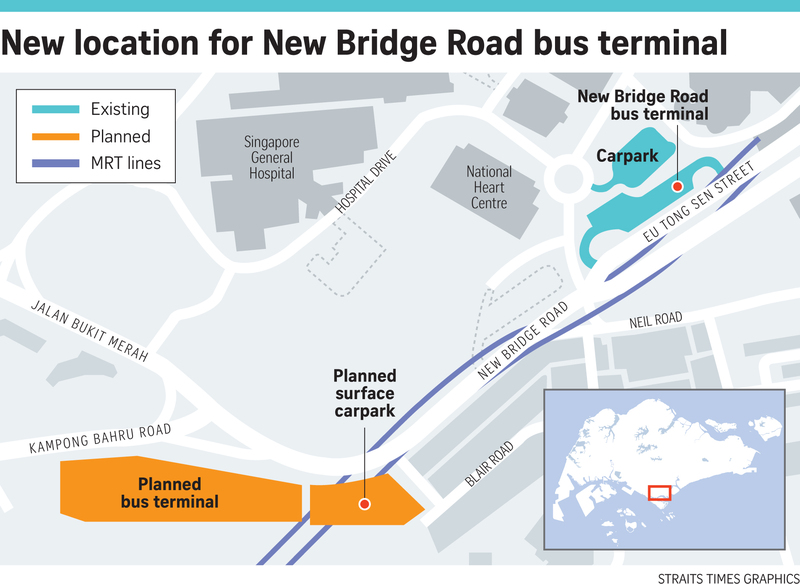 The ministry spokesman said road works will be done to ease bus movements along Kampong Bahru Road and provide safe access to the yet-to-be-built bus terminal and the carpark. Bus routes will also be changed where necessary, she added . The land for the new carpark and bus terminal is near the now- defunct Tanjong Pagar Railway Station. It was once part of a railway yard owned by Malaysian operator Keretapi Tanah Melayu. Rail operations ceased in 2011 and the Malaysian railway land was returned to Singapore. The train tracks were subsequently removed. Residents in the area are resigned to face more noise and dust. The railway land has undergone several changes since it was handed over to Singapore. The nearby Tanjong Pagar Railway Station was gazetted as a national monument in 2011. Two blocks of flats in nearby Spooner Road that used to house railway staff were converted to rental homes for the lower-income. A 1930s bungalow for train drivers to spend the night before they began their early-morning shift is now a Montessori pre-school. For Mr Kishore Kumaar, 33, who runs a 24-hour roti prata shop in Kampong Bahru Road, the new development is good for business. "Parking spaces are very limited here. It may bring more people to this area," he said.